America, with all its diversity, is not easily defined. David J. Smith's If America Were a Village takes a snapshot - past, present and future - to help define America for children. 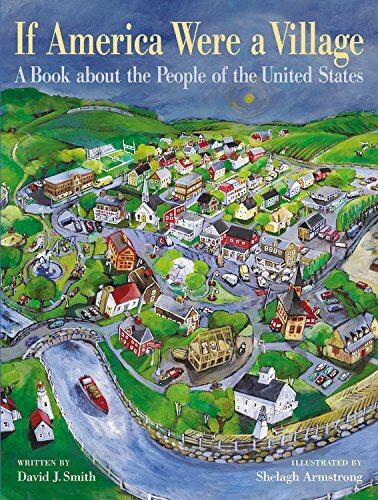 Using the same successful metaphor of the international bestseller If the World Were a Village, the book shrinks down America to a village of 100. The metaphor helps children easily understand American ethnic origins, religions, family profiles, occupations, wealth, belongings and more. Shelagh Armstrong's expansive illustrations imagine America as a classic, vibrant small town. Who are the people living in this vast and varied nation? Where did they come from? What are they like today? How do they compare with people in other countries? The book's simple statistical analysis provides a new way of learning about where people live in America, the state of their health, the shapes and sizes of families, what they use and more - forming a concise picture of a country. If America Were a Village is part of CitizenKid: A collection of books that inform children about the world and inspire them to be better global citizens. About Shelagh Armstrong (Illustrator) : Shelagh Armstrong is a published illustrator of children's books. A published credit of Shelagh Armstrong is If the World Were a Village: A Book about the World's People.